What can the price of a cup of joe teach us about family? Last year (2016), CUPS Coffee & Tea in Roanoke, VA, taught a great lesson that applies to families and the Family Bank of Honor. (Read about the coffee shop here). The owner “felt the need to help solve all the injustices of the world” and decided to start close to home by encouraging polite manners and connection. 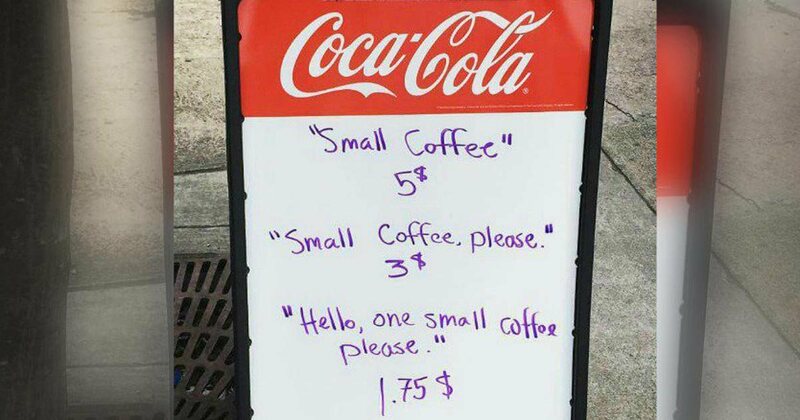 So, he put up a sign outside his coffee shop, a menu with prices associated with how a person orders their coffee. If someone simply ordered “one small coffee” the charges was $5. However, if they politely placed their order with a “one small coffee, please” the cost was reduced to $3. 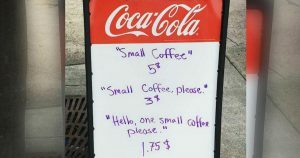 But, you could get the same cup of coffee for a mere $ 1.75 if you connected before placing a polite order: “Hello, I’d like one small coffee please.” His sign went viral in a matter of days. I think he had a great idea. “Solving the injustices of the world” begins at home. We can contribute by encouraging polite manners and connection within the family and with those our family meets. Each time we make a connection with a family member, we invest in the Family Bank of Honor. Each time with make a polite statement, we invest in the Family Bank of Honor (Learn more about the Family Bank of Honor). The more we invest in the Family Bank on Honor, the stronger and more intimate our family bond. And the stronger our family bond, the greater the potential impact on the world (Hot Sauce Vs. the Power of Relationship). Just like that coffee shop owner, encourage your family to practice polite manners and a little connection…and change the world!